CUSTOM DESIGNED & BUILT CARPORTS, GARAGES, WORKSHOPS & SHEDS. Need a new custom size carport, garage or pergola? We specialise in providing affordable carports and entertainment areas. Need more backyard storage for bikes & tools? Need a Commercial or Industrial shed or workshop? Wide span steel structures custom designed and built for your business. 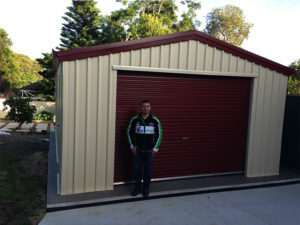 Outdoor Garages and Sheds are Sydney’s leading builder of carports, garages and sheds. Contact us to discuss your domestic, commercial or industrial colorbond steel shed and garage requirements. We can help you design a solution to meet your needs and budget. Why choose Outdoor garages and sheds, Sydney? We are ShedSafe accredited from the Australian Steel Institute. We use only Bluescope quality Australian steel components. Locally owned and family operated with over 10 years building industry knowledge. Visit our showroom, located in Beverly Hills, Sydney, in the St George and Sutherland Shire District. We can help you design a garage or shed that is just right for your home or business. Our reliable team of expert tradesmen install our quality Bluescope steel products all over Sydney and Australia.